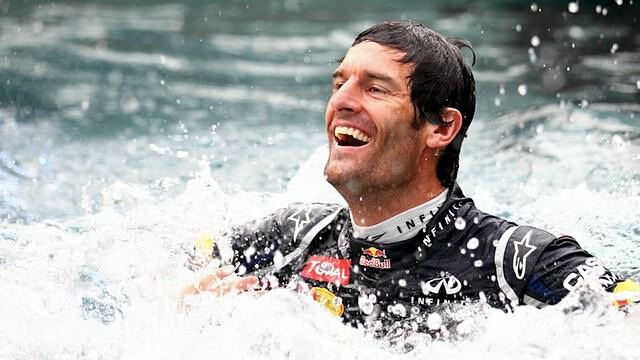 This is F1Minute - Mark Webber wins from pole position in Monaco. There was talk of rain throughout the Monaco Grand Prix, with teams warning their drivers that it could be coming any moment - but the wet weather never materialised. Instead, drivers were forced to focus on their tyre strategy, and for the top ten finishers, that was a one stop deal. Mark Webber led the way from pole position, getting a surprisingly good start off the grid, and then again after a brief Safety Car period a few laps in. Romain Grosjean and Michael Schumacher collided at the first corner, with the Lotus out of the race, and Schumacher managing to continue - although he later retired. Meanwhile, Pastor Maldonado, Pedro de la Rosa and Kamui Kobayashi also tangled and all three ended up out of the race. Other retirements include Charles Pic, Vitaly Petrov, Daniel Ricciardo and Jenson Button. Sebastian Vettel left his one stop to the very last minute, waiting until lap 46 before diving in for fresh tyres. Webber remained in the lead, taking the chequered flag with Nico Rosberg and Fernando Alonso behind. Alonso now takes the lead of the driver’s championship by just three points from joint Red Bull drivers.